Studying Chinese in a comfy corner of the AeroCaffe in internet cafe in Boise. Some of the choices at the AeroCaffe internet coffee shop in Boise. The AeroCaffe (this link being for it’s simple webpage) is at 201 North Orchard Street, which is just a couple of small blocks north of Franklin Road. I found this location to be easy access, close to much of Boise, but not mixed in the mire of downtown or university madness. It is not too far from Boise Towne Square, making it both close to the freeway (good for those coming from surrounding towns), but not close enough to be complicated by that traffic. 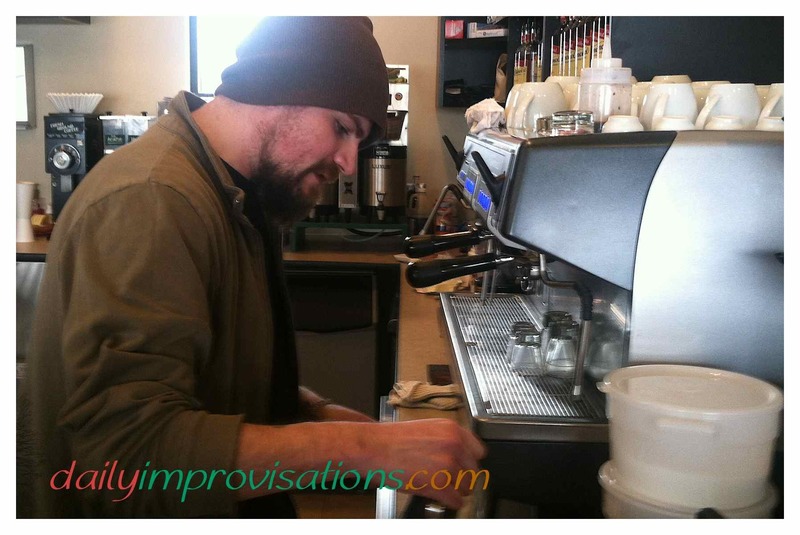 The barista enjoys his work. More importantly, when we entered the cafe, we were greeted with professional friendliness from the moment we stepped in the door. I knew it was a new store and the man behind the counter was so gracious that I wondered out loud if he was the owner. No, he was not. How nice to see such dedication from an employee! I verified that they had internet, explaining that we hoped to have our Chinese lessons there. There were 2 other people in there, so we chose a corner of one of the 3 semi-divided spaces. One room was separated more than the others, but a man was busy on his computer back there. There were quite a number of very clean tables surrounded with comfortable looking chairs. Then, I went back to the counter to get something warm to drink and a snack, because I had forgotten to eat lunch. I have been in a few coffee shops looking for something suitable for this non-coffee-rare-tea-drinker. I have tried a few recommendations, but no one can ever seems to grasp the idea of how mild I like my hot drinks. When I began to explain my dilemma to this barista, he recommended a flavored hot milk. I chose vanilla. He also recommend their savory, but mild, bacon and onion bagel with sea salt. 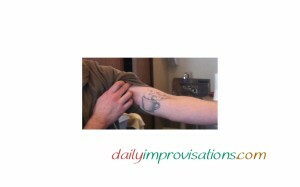 The barista’s fun coffee mug tatoo. At this point, I was so impressed with the whole place that I mentioned that I would be interested in writing about the cafe on my blog and could I take a few photos? Yes, that would be nice. I proceeded to get a little more professional history from the barista. He had worked at a Moxie, but “his” store was closed. He was unemployed for a while, then found this job in the classified ads. 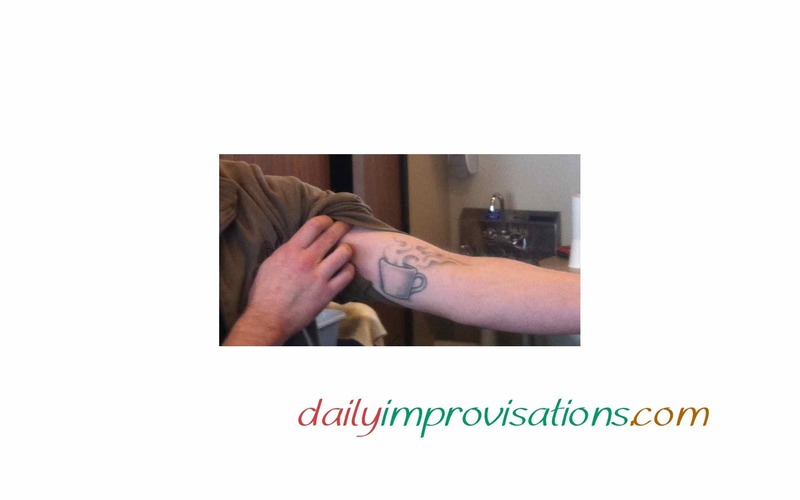 He grinned as he showed me his steaming coffee cup tatoo on the inner aspect of his left upper arm. 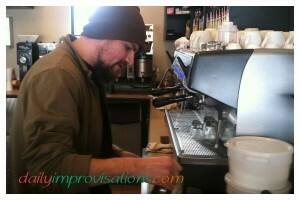 He likes being a barista! The hot vanilla flavored milk was perfect, as was the toasted bagel. The airplane art, including large models hanging around, were a blend of playful and sophisticated. Kind of like your mom’s house looks after the kids leave and she can keep it clean. 😉 Very comfortable because it is orderly, but welcoming you to take up space and sit a while. 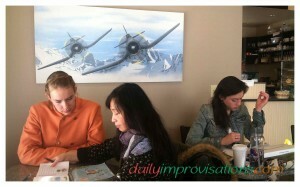 I plan on visiting this coffee shop for future Chinese lessons. Or for meeting friends who are afraid of the drive to Nampa. Or maybe using it as a place to rest when I have a longer day of errands around Boise. If you are looking for it, and are coming from Franklin, watch for the Chevron station on the left. There is a little side street right after that called Bethel Street. Turn left, then turn right into the little parking lot right behind the cafe. Maybe I’ll see you there! 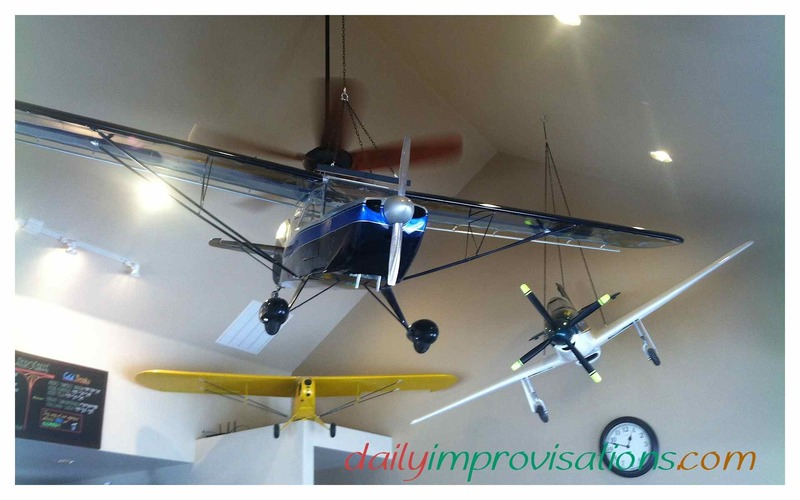 The AeroCaffe has some very fun model airplanes!